Beds afford dogs with the same kind of comfort that we obtain from our respective beds. However, there are instances or situations when an ordinary dog bed is simply not enough. Dogs that are currently sick or those with musculoskeletal problems or even those that are already in the advanced stages of aging can benefit more from the use of orthopedic dog beds. And if your vet has already recommended that you buy an ortho bed for your hound but you’re not sure which type of bed to pick, worry not as our list of the 8 best orthopedic dog beds should get you underway. 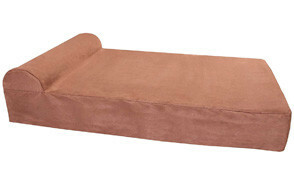 Considered by many as one of the best when it comes to orthopedic beds for dogs, the Furhaven Ultra Plush / Velvet Orthopedic Dog Couch Sofa Bed comes in with bolstered sides and back to give your pet the ultimate in canine comfort. At its core is an egg crate-type of support foam which effectively channels heat away from your dog’s body while also relieving pressure from its bony prominences like the joints. The bolsters are filled with eco-friendly, high-loft polyester fiber, giving your pet comfort and support especially on its neck. It looks exceptionally stylish, too, opting to use faux fur materials for its cover to give your pet a really comfy bed to rest both its head and its body. The Furhaven Ultra Plush is available in 4 different sizes and 7 different color styles so you get to choose one that easily matches your existing interior décor. The Snuggly Sleeper from BarksBar looks like a miniature couch that doubles as a lounger, perfect for resting the tired body of your hound. More importantly, it is composed of a 4-inch foam base that is constructed of human-grade, premium quality orthopedic foam. It comes with bolsters surrounding the entire bed, although lower up front granting easier access for your dog. Under the bed is a rubberized bottom panel, keeping the bed in place especially if you have slicker tiles. Covering the Snuggly Sleeper is a quilted material that can be easily removed to be cleaned in your washing machine. The bolsters serve as pillows, gently providing cushion for your dog’s cervical vertebrae. The Snuggly Sleeper is pleasant to look at, although it would have been a lot better if there are other design options to choose from. Nevertheless, based on the comments of pet parents, the Snuggly Sleeper is a great choice for an orthopedic bed for your dog. 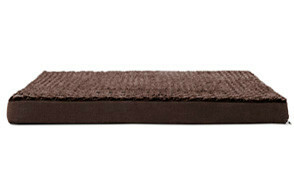 Brindle’s Orthopedic Dog Bed looks like an ordinary mattress that you place over your bed. It doesn’t come with bolsters or pillows or any of that support rim that may prove useful for maintaining a near-perfect alignment of your dog’s spine as it lies down on its side to rest. 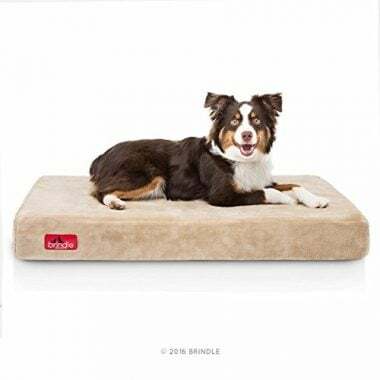 However, the Brindle does come with hypoallergenic materials which should complement the 2-inch orthopedic memory foam resting on a 2-inch high-density support foam. This combination helps provide dogs with healthier, more restful, and definitely pressure-relieving mattress to sleep or rest on. The Brindle is available in 3 sizes and 3 color styles. The options may not be as extensive as you may hope for but it’s better than none. The best part of it is that the Brindle comes with a 3-year limited warranty when most other beds can only muster a 12-month warranty for their products. 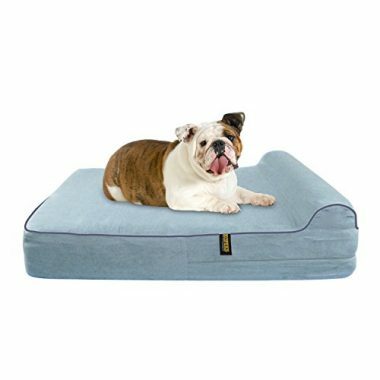 The Pillow Top Orthopedic Dog Bed comes with an integrated pillow on one side of the mattress-type canine bed. The bed itself is uniquely designed with a combination of 2 different kinds of foam. An inner H45 high-density support foam is sandwiched between two 2-inch H10 comfort foam providing your dog with a full 7 inches of extra-soft, ultra-comfortable bedding. The Big Barker doesn’t utilize a closed cell foam system that is typical in conventional memory foams. Instead, it uses an open cell type which allows for air to naturally circulate through the foam, eliminating heat from the surface, and bringing cool, relaxing comfort for your pet. Laser imaging studies show that the system provides greater heat absorption and better weight distribution, giving the Big Barker an exceptional ability to soothe the bodies of dogs that may have musculoskeletal problems. It is no wonder then that the Big Barker scores remarkably high in consumer ratings. The downside? Well, because of its superior craftsmanship and thoughtful engineering, the Big Barker will set you back for a couple of Benjamins or so. It’s still a small price to pay for giving your dog the best orthopedic bed it needs especially when you consider it comes with an unheard-of 10-year warranty. PetFusion’s Ultimate Dog Lounge Premium Edition is a substantially beefed-up lounger complete with bolsters on the sides and back and about a third on each end of the front. It’s like a traditional bolstered donut ring but seriously upgraded with high-quality 4-inch memory foam. About 2.5 times cheaper than the Big Barker, the PetFusion provides a great bed for dogs with articular and musculoskeletal issues because of its orthopedic foam. The cover is made of a combination of cotton twill and polyester to give your pet something really comfy to rest on. The same cover is tear-resistant and water-resistant while a rubberized bottom helps prevent the PetFusion from going places on your floor. It’s available in 4 sizes and two color options. Sadly, only its large version comes with the 2-color selection. The rest comes in slate gray. Nevertheless, it still is a great product to consider especially if you like the idea of bolstered beds for your pet’s cervical region. 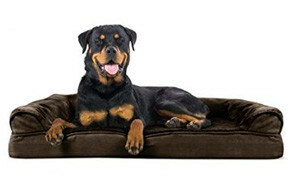 This orthopedic dog bed product from KOPEKS is priced like the PetFusion bed. However, its pillow top design follows that of the Big Barker. It even has the same 7-inch thickness of orthopedic-grade foam seen in the Big Barker. It, thus, makes for a worthy alternative to the Big Barker if you’re especially concerned about its price tag. 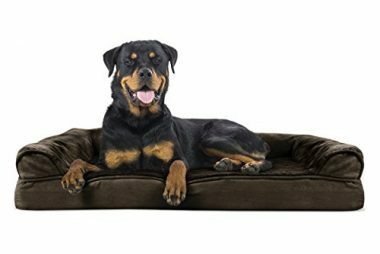 Covering the KOPEKS Orthopedic Memory Foam Dog Bed is a zippered bedcover made with soft micro-suede material complete with a dual layer of waterproof lining. The bottom is also mated with nonskid rubber to keep it in its place regardless of how ‘active’ your dog may be during sleep. It’s available in 3 sizes and 2 colors; not really that much option to begin with. However, it does a good job of keeping your dog’s spin in near-perfect alignment; something that all orthopedic dog beds should have. 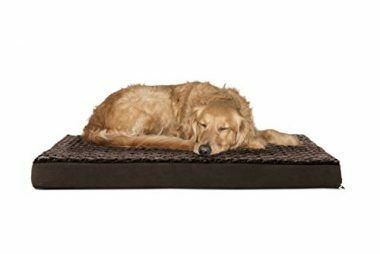 The cheapest among the lot, the Furhaven Pet Deluxe Orthopedic Pet Bed Mattress is perfect for those who require a good-enough bed for their dogs for the price of 10 regular-sized cups of cappuccino from Starbucks. There are 22 different color designs to go with 4 different sizes, too. This should give you superb flexibility in choosing the right orthopedic dog bed for your pooch that matches well with your interior décor. Like the FurHaven Ultra Plush, the Deluxe comes with the same egg crate-type of low VOC foam core, but is now covered with a different material. It comes with suedine gusset for hiding hair and dirt while complementing your décor. For its price, you will need to lower your expectations a bit. As many pet parents have noted, the foam may not last that long. 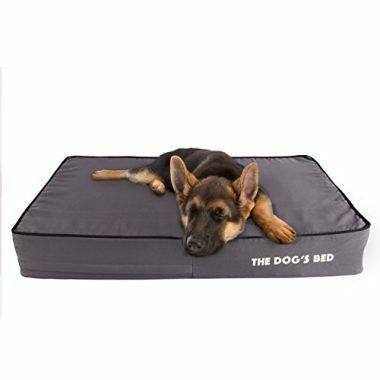 The Dog’s Balls’ Dog’s Bed Premium Orthopedic Waterproof Memory Foam Dog Bed is just like the Brindle bed – mattress-like dog bed without any support for the dog’s head whatsoever. It is covered with premium hypoallergenic Oxford fabric, however, giving The Dog’s Balls excellent protection against spills, mildew, mold, and even dust mites. It comes with a 6-inch thick foam divided into a 4-inch high-stability support foam base and a 2-inch high-care, high-density orthopedic memory foam. There are 5 sizes and 7 color styles to choose from so you’ll never run out of options to match with your décor. If you already have dog support pillows, then perhaps the Dog’s Balls will be an excellent choice. However, if you’re looking to economize the Brindle should be nice. Picking an orthopedic bed for your dog can be exceptionally challenging since they actually look like any other type of bed. To help you choose the right one, we’ve prepared this buying guide specifically tailored for pet parents searching for the best orthopedic dog beds. An orthopedic dog bed is a specialty mattress that is designed specifically to help dogs with musculoskeletal problems sleep better. Unfortunately, the market is littered with dog beds that come with viscoelastic memory foam. While our list did include some of these products, the lack of standards on what can be considered as true orthopedic dog beds only adds to the confusion. To help you better understand what we are talking about, it is crucial to understand a few unique differences between the two. Memory foam is constructed of viscoelastic materials that have been developed by NASA in the 70s. The material was adopted by the mattress industry in the 90s because of its body-conforming properties. It is this ability to conform to different curves and points of the body that makes it ideal for those with weight issues and for promoting a more comfortable sleep. Additionally, a true orthopedic bed doesn’t come with certified standards especially in the type of materials used. As such, dog bed manufacturers have to rely on their understanding of the fundamental principle of orthopedic dog beds – the support of joints, bones, and the rest of the body to improve overall posture and alleviate pain. In essence, a true orthopedic dog bed should keep the dog’s spine in perfect alignment and keep any bony protrusions from receiving pressure from the bed. These are the fundamental principles of a true orthopedic dog bed. Technically, a viscoelastic memory foam dog bed should still be able to provide your dog the kind of support it needs for its body, especially its bony prominences. You just need to look for one that is exceptionally-built for such a purpose. Is it Time for an Orthopedic Dog Bed? There many reasons why you may want to shift your dog from an ordinary canine bed to one that is fully orthopedic. Here are some of the instances when you know it’s time for your dog to sleep on an orthopedic dog bed. If you’re going to look at these instances, pain is a common theme. As such, whenever your dog is in pain having it to sleep on an orthopedic bed should be seriously considered. Based on what we have discussed so far we can readily identify a number of benefits of using orthopedic beds for dogs. Here are some of them. A good orthopedic bed should help keep and maintain the spine of your dog in near-perfect alignment. Bolsters and pillows can help elevate your dog’s head if it likes sleeping on its side. This helps position the neck and head in perfect alignment with the rest of the spine. This can produce better neurologic functioning. Orthopedic beds reduce, if not eliminate, the effects of pressure on body parts where the bones and joints are much closer to the body surface. This helps reduce the intensity of pain while also facilitating the reduction of inflammation. The combination of a well-aligned spine and reduced pressure off bony prominences can lead to better cellular and tissue repair, healing, and regeneration. Since there are no additional stresses being exerted on the body, your dog’s immune system, as well as other organ systems involved in tissue repair, can get to work in repairing and healing damaged body parts. There is one often-overlooked aspect of pressures exerted on bony prominences: reduced blood flow. 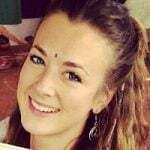 The application of pressure on a body part tends to pinch blood vessels supplying that body part. This reduces blood flow distal to the pressure point leading to a host of problems in the distal part. By reducing pressure points, you also improve the overall circulation of blood in your pet. A classic sign of chronic excessive pressures on bony prominences is bed sores. These first appear as reddish discoloration on the skin. More importantly, however, is the fact that these areas signify inflammatory changes that are slowly degrading the integrity of the skin. Orthopedic dog beds reduce the pressure leading to a reduction in the incidence of bed sores. However, there are certain features that can help you distinguish a good quality orthopedic bed from one that is simply filled with useless fill that do nothing to keep your dog’s vertebrae in near-perfect alignment or even to help relieve pressure off of your dog’s joints, muscles, and bones. Here are some of the features you need to look for. We mentioned above that viscoelastic memory foam and true orthopedic mattresses are not the same, although dog bed-makers say they are. Given that the main disadvantage of memory foam is its poor heat-dissipating properties, you will have to look for an orthopedic dog bed that comes with memory foam that has exceptional thermal management properties, unless of course you also want some form of heating for your pet. Whether or not your pet has been trained not to pee on its bed there will always be instances when accidents happen. For this, you need a dog bed that has an inner waterproof liner that will help protect the orthopedic foam from accidents and even from spills from other sources. If the bedcover comes with waterproofing, then it should also be a great choice. The bedcover should be removable and washable. That being said, its closure mechanism should be sturdy and provide a water-tight seal on the opposing flaps. Most dog bed manufacturers have specific instructions on how their bedcovers should be cleaned or washed. Choose one that can be easily thrown in your washing machine if you don’t like the idea of washing them by hand. Of course, getting one that matches well with your home décor should be a wonderful bonus. If you have a very ‘active’ sleeper you don’t want it to move your bed every time it stirs. 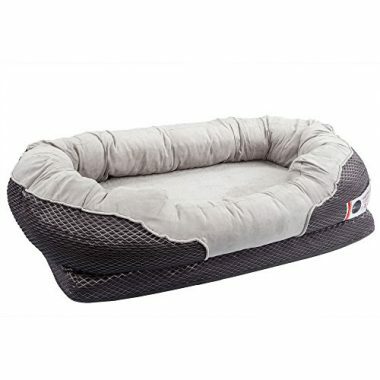 As such choosing an orthopedic dog bed that has non-skid rubber bottoms should be a great choice. However, if you intend to use the dog bed on a rather rough surface, then this feature is not really needed anymore. Choosing the right orthopedic dog bed can be tricky. Perhaps this is made even more confusing by the fact that majority of orthopedic dog beds today are made of viscoelastic memory foam which hardly qualifies as a true orthopedic bed. 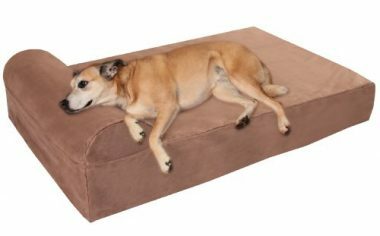 Nevertheless, since the majority of the products classified as ‘orthopedic dog beds’ contain memory foam, it has become the standard in such types of dog beds. This should not stop you from really looking for the best orthopedic dog bed.